Tomorrowland was originally devised as Walt’s vision of what the future might look like. The fun thing about Tomorrowland is that “tomorrow” or the future can always look different than today. This is a great “land” for dreaming and adventure. My family and I can spend hours in Tomorrowland alone. A suggestion is to enjoy Tomorrowland in both daytime and night. You will be amazed at the differences. I personally love this land even more at night. The lights and atmosphere make me want to hang out in Tomorrowland forever! 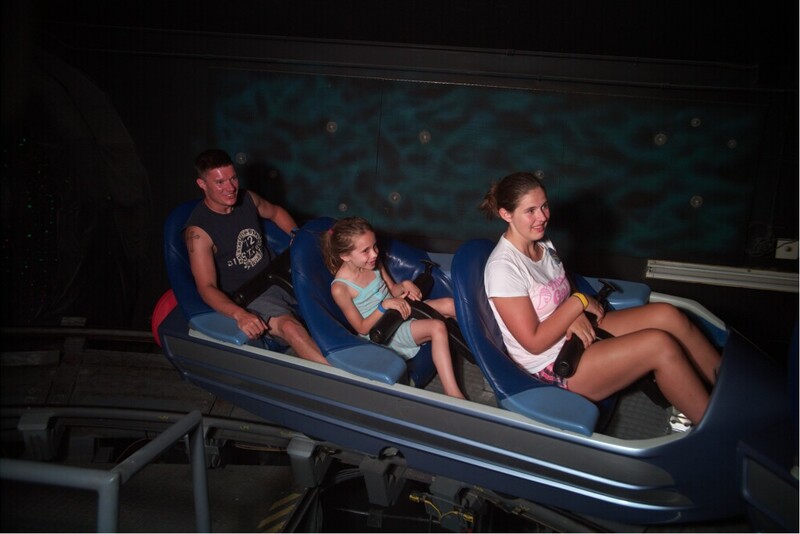 Space Mountain – One of the most iconic rides at Walt Disney World! Space Mountain never fails to leave me smiling and feeling better than before I rode it. If you have trouble just enjoying things for fear of others seeing your reaction, this is your ride. You will smile, laugh, and possibly scream with excitement and surprise on this dark ride. Don’t worry, nobody can see you and you cannot see them, so just enjoy yourself! Astro Orbiter (Tomorrowland Transit Authority) – I feel like Astro Orbiter never gets the love it deserves. While this is a spinning ride in the form of Dumbo, but with Rocket ships, the similarities stop there. Astro Orbiter is high above the ground and moves pretty fast. I love this ride, especially at night! People Mover – While not an adrenaline rush ride, this is a fun ride that is relaxing. You can enjoy this ride with your family and just sit back and relax. I won’t ruin some of the surprises of this ride, but I will tell you, make sure you ride this at night and enjoy the views! Tomorrowland Speedway – The iconic Speedway where so many have gotten behind the “Wheel” for the first time. Fun ride to enjoy with younger kids or for nostalgic purposes. Buzz Lightyear’s Space Ranger Spin – A “shooter” spinning ride at Disney. Don’t worry, you can control how much or how little you spin. The ride allows for 2 riders per cart and there is a “blaster” for each rider. You goal is to help Buzz Lightyear and defeat Zurg by “blasting” as many of the targets as possible. Stich’s Great Escape – This attraction is rumored to be replaced soon. The attraction is only open seasonally and in 2017 the name was changed to Stitch’s Alien Encounter Character Greeting. We will know soon what will happen here. Monsters, Inc, Laugh Floor – This is a fun way to get out of the sun and enjoy sitting down and laughing at the comedy of Mike from Monsters, Inc. Great for all ages. Carousel of Progress – One of the oldest attractions at Walt Disney World. This is a tame, but classic attraction showing progress of technology through the years. All eateries in Tomorrowland are quick-service restaurants. Tomorrowland Terrace – Although this is a large restaurant, it is rarely open. It is used for special events and provides a nice view of the fireworks. Cosmic Ray’s Starlight Cafe – A quirky and fun place to eat with many different choices. This is the main eatery in Tomorrowland. While you eat, you can enjoy the alien musical entertainment from Sonny Eclipse! The Lunching Pad – A great place to grab a quick bite. Outdoor seating only. Tomorrowland is one of 5 “lands” at Disney World’s Magic Kingdom. The best way to enjoy Tomorrowland is to take your time and enjoy the atmosphere. As I mentioned earlier, it is like a whole other “land” at night compared to the day. If I could only go either at night or during the day, I would pick to go to Tomorrowland at night. We hope you enjoy your next trip to Magic Kingdom and that this helps you enjoy Tomorrowland even more than before!